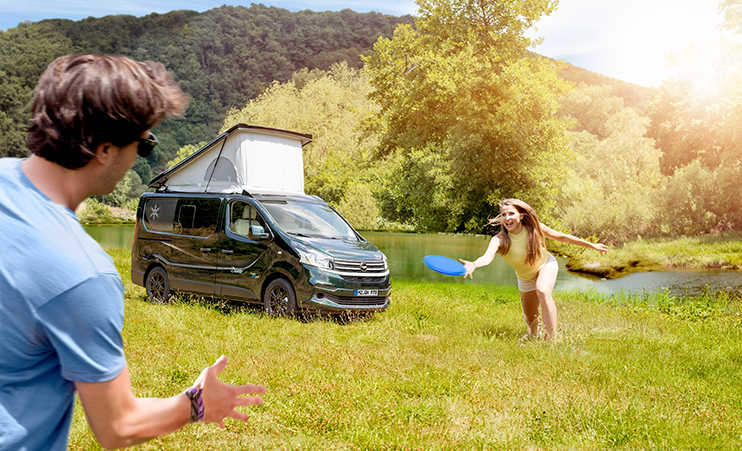 On the basis of the Fiat Talento, the new Danny series sets itself apart from its field of competitors by consistently aligning the equipment to fit good everyday characteristics and comfortable camping holidays. The Danny series wants to be more of a mobile home for everyday use than a modular all-rounder vehicle with some side-benefits for caravanning. This is very evidently demonstrated by the complete camping equipment. With a width of 1.96 m and a height of 2.06 m, the short Danny 490 is only 4.99 m in length – thus more like an SUV in terms of dimensions – and is fitted with important comfort features such as a refrigerator and wardrobe. The electric drive for the adjustable roof is particularly practical, making roof handling child’s play (optional). The kitchen has a two-hob piezo cooker and a stainless-steel sink. The rear bench is permanently installed and can be converted into a fold-down sofa, there are two large drawers under the seat that can store a lot of camping equipment. To save space, the table can be unhooked and stored behind the bench. In everyday life, this creates a large storage space behind the bench and in the footwell of the seating group. Folding down the bench creates a long load-through provision of over 2m. This means that the Danny 490 breaks with both the classic comfort restrictions of a campervan for leisure use and, on the other hand, with its compact dimensions and powerful engines up to 145 HP, offers good everyday characteristics without wanting to be a modular transporter or team bus. In other words, without having to accept any restrictions in everyday use, campers can always take their leisure equipment with them in the Danny and set off for their leisure activities spontaneously on weekends. Thanks to the complete equipment, even longer trips are a pleasure.